Veal is often my first choice when I am looking to create a feast for a special occasion dinner. This meat, which is frequently passed over by others, is luxurious and unbelievably tasty. With so many cuts of veal available it is also very versatile and easy to cook. Not only is it tasty but veal is also a lean meat that is packed with nutrients. Less than 400 calories per 3 oz. serving, it fits perfectly into my healthy way of eating. I'll admit that veal tends to be on the more expensive side when it comes to meat choices but in my opinion, the delicate taste and velvety texture are worth the added expense. When raised correctly, like the veal from the Cedar Springs family, the taste just can't be beat. Cedar Springs ranches are all family owned, right here in the US and provide a safe housing environment for the animals. Calves are fed a nutritious, wholesome diet and are kept happy and healthy. You can find out more about them here. The veal rack in particular is one of those cuts of meat which screams special occasion. This easy to prepare and succulent cut makes an elegant presentation on any table. I was recently sent two beautiful racks of veal from Cedar Springs and decided to make it for Easter dinner. The meat was tasty and tender and enjoyed by the entire family. I would definitely make this again. Combine the garlic, fennel pollen and all the fresh herbs in the bowl of a mini food processor and grind coarsely. Add the olive oil, salt and pepper and process to a paste. Rub the paste all over the veal racks. Cover with plastic wrap and refrigerate for two hours or overnight. Remove the meat from the refrigerator 2 hours before roasting. Preheat the oven to 450°. Arrange the racks back to back with the frenched bones crisscrossed and pointing upwards. Roast the racks in the lower third of the oven for 15 minutes. Reduce the oven temperature to 350° and continue to roast for about 1 hour and 20 minutes longer, or until an instant-read thermometer inserted in the thickest part of the meat in the center of one of the racks registers 130° for medium meat. Transfer the racks to a carving board, cover loosely with foil and let rest for 15 to 20 minutes. To serve, slice down between the rib bones and serve 1 chop per person drizzled with infused oil. Heat oil and herbs in a small saucepan over medium heat. Bring to a boil and let simmer for two minutes. Season with salt and pepper. Pour into a bowl and let cool before serving drizzled over veal. Looks beautiful. I've never cooked veal but my husband loves it! I've never had veal, but your photos and recipe (loaded with herbs and spices..yum) have my mouth watering. Yum! I never really thought about the possibility of different cuts of veal. I suppose it's because I have only had it twice! This looks delicious! That meat looks so juicy and tender. Love all of the herbs, especially the fennel! I've never cooked veal but my mom used to make it for us once in a while back in the day. Love it! I've never used fennel pollen and I eat fennel all the time. The veal looks great but I love the herb infused olive oil the best. Oh yes these look awesome. I never cooked a rack like that before. I am familiar w/ cedar springs veal though and it's top notch! This looks awesome and what a great combination of herbs and flavors! Thanks also for the information about Cedar Springs, I'll have to look into it. There is something spectacular about a perfectly cooked piece of meat! Thus rack of veal is great! 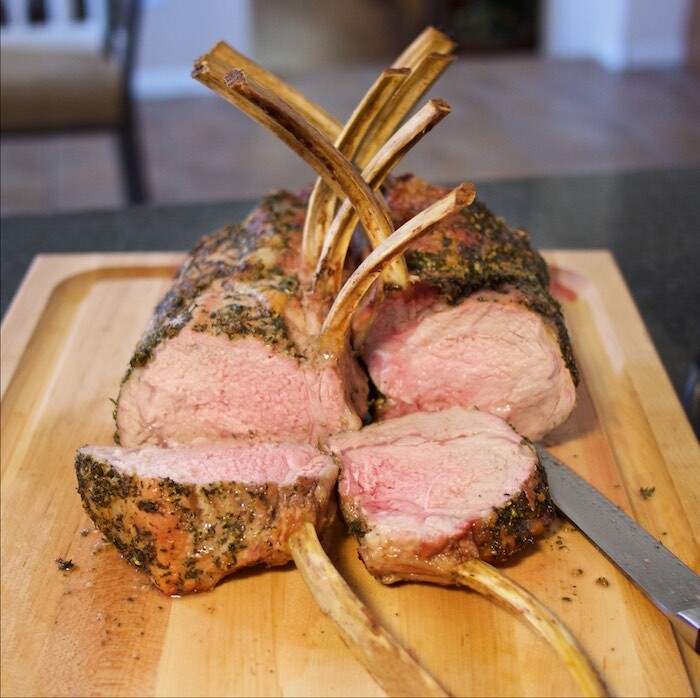 That is one beautiful looking veal rack! Love how easy the recipe is. This has my mouth watering, I've never had rack of veal and I really want to try this. This looks like a meal that my husband will love! His whole family I think will love it too! I'll have to make this for them! Herbs x2, in the paste and the oil, sounds like the winning trick! Wow, what an amazing cut of meat, looks delectable!! So mouthwatering and what a beautiful presentation! I love the idea of the fennel pollen. I have a tin of it. I may try that with the Veal cutlets I have left. Oh, so much incredible yum here! Yes PLEASE! They look so juicy,tender and delicious and that herbed olive oil surely has a lot to do with it! Just gorgeous! What a lovely presentation! Veal is one of my favorite meat, and prepared with herbs it looks very tasty! I adore veal! Have serious cravings for this now - it looks like it has been cooked to perfection Theresea! I think I need to grab a fork and come over! This looks perfectly cooked and the flavours sound delightful!! This really does look fantastic!! OH WOW! This looks perfect!! !